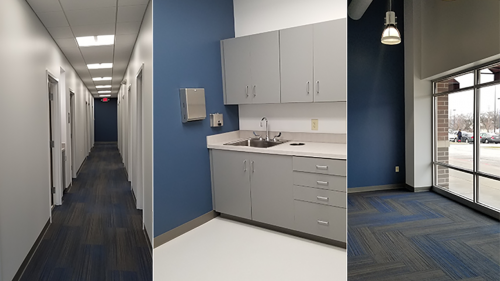 Construction of the new Cleveland Lower Extremity Specialists (CLES) office in Parma, Ohio, is rapidly approaching completion. This medical space— designed by Michael Augoustidis, AIA, IIDA, NCARB and JMT Architecture— will serve podiatry patients with a waiting room and reception area, an administrative office and storage spaces, physician offices, conference room, restroom facilities, X-ray room, lounge, and multiple exam and procedure rooms. JMT provided programming, planning, and design of almost 3,000 SF of space. Working closely with Rycon Construction on submittal responses and identification of long-lead items, the team was able to reduce the construction schedule by almost two weeks. The office is expected to open in mid-March 2019. JMT Architecture is an expert in designing healthcare office and clinic spaces, having completed several ready-care and specialist spaces throughout Ohio and Maryland. For CLES, JMT Architecture’s programming efficiently utilized the available space within the building shell. Utilizing current health-care design paradigms, the team ensured that the patient and staff experience was carefully considered. The efficient patient flow from the waiting area, to an exam room, to check-out are critical to a positive patient experience and productive staff. To JMT Architecture, the details matter. Augoustidis met with the doctors numerous times to ensure the design met their expectations and provided efficiencies to maximize the patient experience. Augoustidis’s profile can be found here.